I made a New Year’s Resolution to write more, particularly in my blogs, but a data clean-up project pretty much distracted me for the last few weeks. Collectorz.com released an upgrade to its Music Collector database software that finally includes support for Unicode. It’s been a highly-requested feature but one that’s been difficult to implement. I’ve been using the software to track my music collection since the late ’90s, and I would have loved Unicode support at the peak of my Japanese music craze. This upgrade pretty much set me on a course to clean up my data, which in turn allowed me to explore features in Music Collector that I’ve never used. 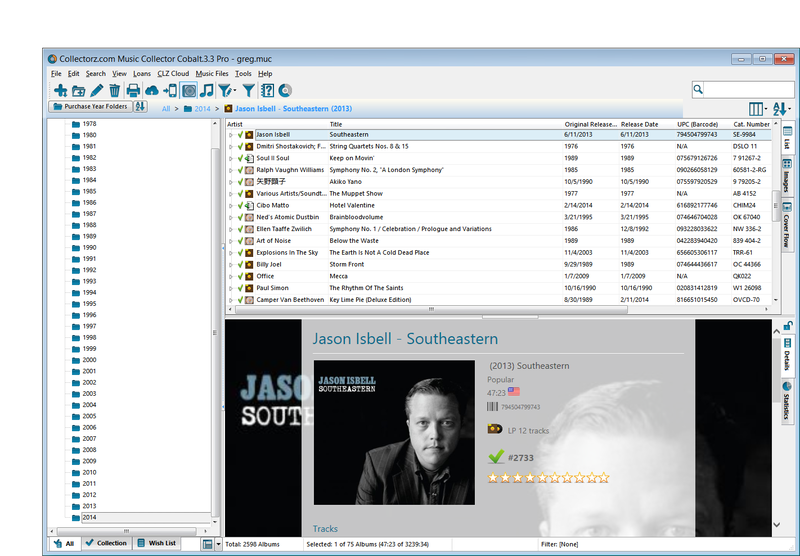 One such feature is an account on Collectorz Connect, an online version of the software maker’s desktop products. Here’s the Musicwhore.org collection. I used to keep track of my collection online with various other services, such as Rate Your Music and Discogs, but given my particular … eccentricities, I would end up adding a lot of titles to these services. All that duplicated data entry strikes me as wasteful, if not tedious. The Connect account allows me to stroke my ego without having to keep adding the NUMBER GIRL discography to dozens of databases with conflicting schemas and style guides. I’ve also been using the Collectorz Music mobile app to organize shopping lists. I just sync my desktop database with the app through wi-fi, and I have a handy reference during my crate digs. I’m pretty sure all this centralized organization has contributed to an increase in expenditures. The vinyl bug that bit me last summer has morphed into land grab for CDs. They’re going out of print, and what happened to vinyl in the early ’90s is now happening to compact discs. People can’t get rid of them fast enough, which means ripe picking for those of us who still like to own music. If you browse my most recent purchases, you’ll find very few titles from new artists. Yup. I’ve become one of those music consumers — stuck in the past and disconnected from the zeitgeist.